Association mining is commonly used to make product recommendations by identifying products that are frequently bought together. But, if you are not careful, the rules can give misleading results in certain cases. Association mining is usually done on transactions data from a retail market or from an online e-commerce store. Since most transactions data is large, the apriori algorithm makes it easier to find these patterns or rules quickly. So, What is a rule? This means, the item/s on the right were frequently purchased along with items on the left. How to measure the strength of a rule? The apriori() generates the most relevent set of rules from a given transaction data. It also shows the support, confidence and lift of those rules. These three measure can be used to decide the relative strength of the rules. So what do these terms mean? Lets consider the rule A => B in order to compute these metrics. Lift is the factor by which, the co-occurence of A and B exceeds the expected probability of A and B co-occuring, had they been independent. So, higher the lift, higher the chance of A and B occurring together. Lets see how to get the rules, confidence, lift etc using the arules package in R.
Lets play with the Groceries data that comes with the arules pkg. 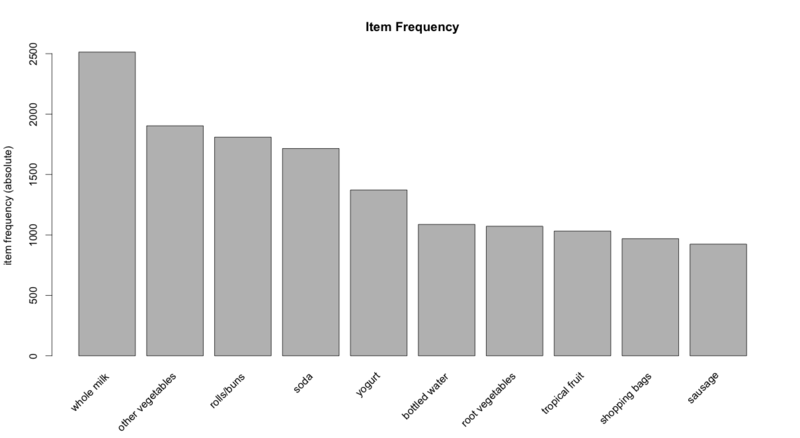 Unlike dataframe, using head(Groceries) does not display the transaction items in the data. To view the transactions, use the inspect() function instead. Since association mining deals with transactions, the data has to be converted to one of class transactions, made available in R through the arules pkg. This is a necessary step because the apriori() function accepts transactions data of class transactions only. If you have to read data from a file as a transactions data, use read.transactions(). #>  "citrus fruit"        "semi-finished bread" "margarine"
#>  "tropical fruit" "yogurt"         "coffee"
How to see the most frequent items? The eclat() takes in a transactions object and gives the most frequent items in the data based the support you provide to the supp argument. The maxlen defines the maximum number of items in each itemset of frequent items. How to get the product recommendation rules? rules <- apriori (Groceries, parameter = list(supp = 0.001, conf = 0.5)) # Min Support as 0.001, confidence as 0.8.
rules_conf <- sort (rules, by="confidence", decreasing=TRUE) # 'high-confidence' rules. rules_lift <- sort (rules, by="lift", decreasing=TRUE) # 'high-lift' rules. The rules with confidence of 1 (see rules_conf above) imply that, whenever the LHS item was purchased, the RHS item was also purchased 100% of the time. A rule with a lift of 18 (see rules_lift above) imply that, the items in LHS and RHS are 18 times more likely to be purchased together compared to the purchases when they are assumed to be unrelated. How To Control The Number Of Rules in Output ? Adjust the maxlen, supp and conf arguments in the apriori function to control the number of rules generated. You will have to adjust this based on the sparesness of you data. To get ‘strong‘ rules, increase the value of ‘conf’ parameter. To get ‘longer‘ rules, increase ‘maxlen’. How To Remove Redundant Rules ? Sometimes it is desirable to remove the rules that are subset of larger rules. To do so, use the below code to filter the redundant rules. rules <- rules[-subsetRules] # remove subset rules. How to Find Rules Related To Given Item/s ? To find out what customers had purchased before buying ‘Whole Milk’. This will help you understand the patterns that led to the purchase of ‘whole milk’. The is a case to find out the Customers who bought ‘Whole Milk’ also bought . . In the equation, ‘whole milk’ is in LHS (left hand side). rules <- apriori (data=Groceries, parameter=list (supp=0.001,conf = 0.15,minlen=2), appearance = list(default="rhs",lhs="whole milk"), control = list (verbose=F)) # those who bought 'milk' also bought..
One drawback with this is, you will get only 1 item on the RHS, irrespective of the support, confidence or minlen parameters. For both rules A -> B and B -> A, the value of lift and support turns out to be the same. This means we cannot use lift to make recommendation for a particular directional ‘rule’. It can merely be used to club frequently bought items into groups. In real world, it would be realistic to recommend headphones to a person who just bought an iPhone and not the other way around. Imagine being recommended an iPhone when you just finished purchasing a pair of headphones. Not nice!. While selecting rules from the apriori output, you might guess that higher the confidence a rule has, better is the rule. But for cases like this, the headset -> iPhone rule will have a higher confidence (2 times) over iPhone -> headset. Can you see why? The calculation below show how. As, you can see, the headset -> iPhone recommendation has a higher confidence, which is misleading and unrealistic. So, confidence should not be the only measure you should use to make product recommendations. So, you probably need to check more criteria such as the price of products, product types etc before recommending items, especially in cross selling cases.